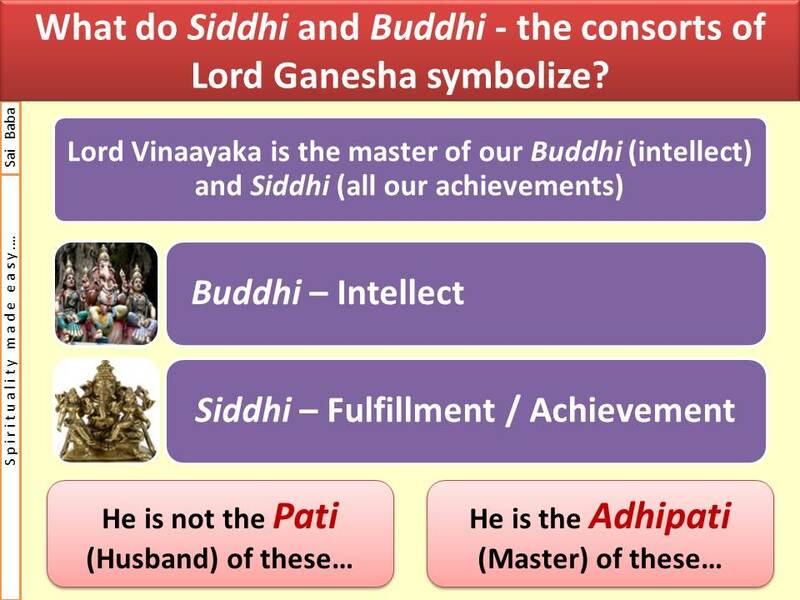 What is the inner significance of Siddhi and Buddhi – the consorts of Vinaayaka? Vinaayaka is the one with the power and capability of supreme intelligence. Humans derive happiness and joy because of the combination of Buddhi (intelligence) and Siddhi (fulfilment or achievement). Therefore, in the worldly stories (Puranas), Siddhi and Buddhi are referred to as the consorts of Vinaayaka. Since, He is the master (adhipati) of intellect and wisdom, He is referred to as their husband (pati). 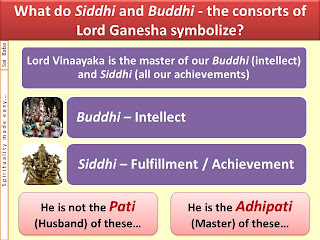 Thus being the master of Siddhi and Buddhi, Vinaayaka is called the leader or the adhipati of these. Humans derive happiness and bliss because of the combination of Buddhi (intelligence) and Siddhi (fulfilment or achievement). That is why; happiness and bliss are also referred to as the children of Vinaayaka. Such metaphors and analogies give some satisfaction to the people in the worldly and physical sense. (Truly speaking) how can Vinaayaka, who has no desires or any mental feelings, have any wives or children? Pati does not necessarily mean husband; it means adhipati (master). He is called the husband of intellect and wisdom as He is the master of these two. 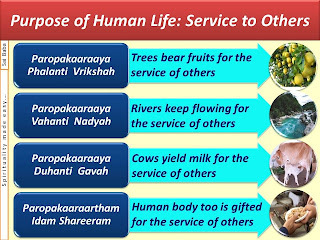 Vinaayaka is the one with a pure heart. Siddhi (fulfilment or achievement) and Buddhi (intellect) are His two eyes. The two eyes of Siddhi and Buddhi are regarded as His two consorts. Thus Vinaayaka is the Nayaka or the leader of Siddhi and Buddhi. 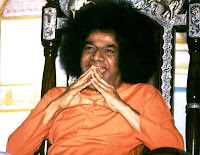 To have Siddhi (fulfilment), one must have Buddhi (intellect). To have Buddhi (intellect), we must develop the feeling of gratitude in us. For the one without any gratitude, the intellect will be destroyed. Once the intellect is destroyed, how can you have any fulfilment or achievement? 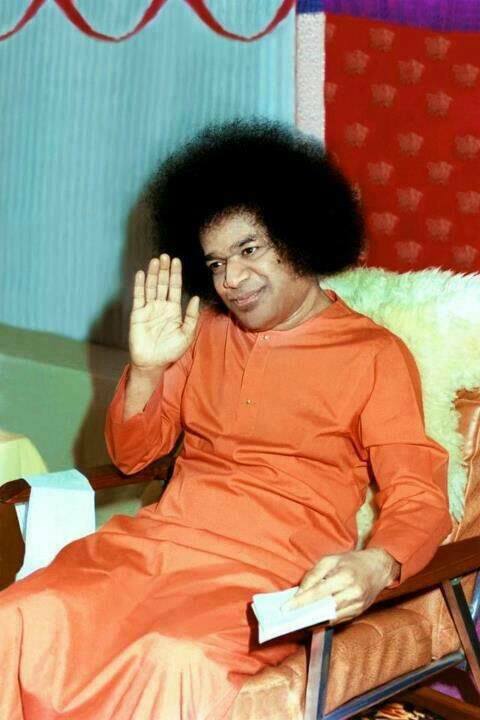 Sarva Siddhi Sampradaaya Namah – Vinaayaka is the one who bestows on you all the achievements (success). We need to make an effort to recognize this principle of Lord Vinaayaka. 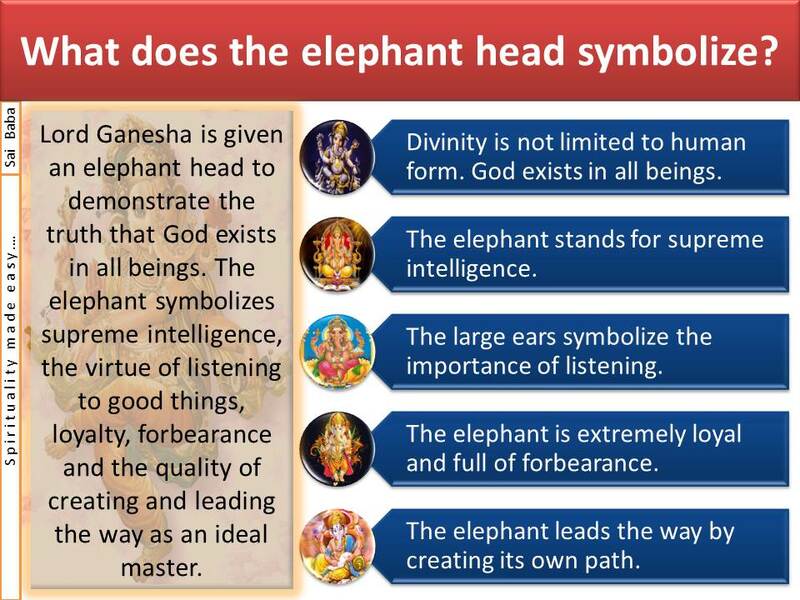 What is the inner significance of the elephant head of Ganesha? 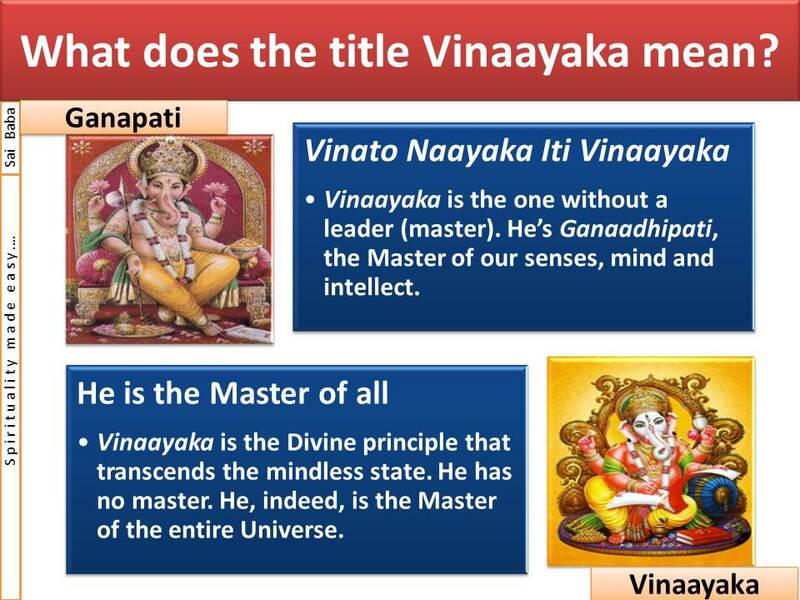 Vinaayaka has supreme intelligence. 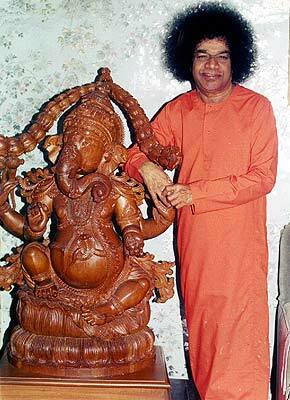 In the morning when I came to the Hostel, Sai Gita (the elephant) came towards Me trumpeting with delight! She does not trumpet at any other car. My car came and behind My car, there were another 80 cars. The moment My car came and she heard the sound of My car, she came trumpeting loudly to the road. See, how clever she is. She has so much wisdom and intelligence. That is why any individual who is very intelligent is generally referred to as the one having the intelligence of an elephant (gaja telivi – elephant intelligence). The elephant has such supreme intelligence. 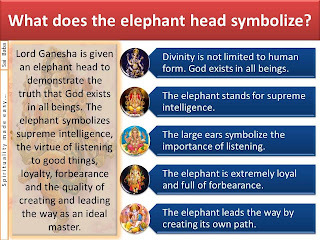 Therefore, the reason behind placing an elephant head for Vighneshwara, is to declare to the people through this symbol, that He is the one of great intelligence. Otherwise, why else would they create Him with human hands and legs and with the head alone as an elephant head? They gave maximum importance to His intelligence (medha shakti – power of intelligence). Apart from the above, it is necessary that we must first listen to anything that is said. In Vedanta, the three most important aspects are Sravanam (listening), Mananam (contemplating) and Nidhidhyaasanam (assimilating). Only when you hear first and contemplate subsequently, you can put something into practice. Without listening and without contemplating, how can you put anything into practice? Therefore, Sravanam – the ears of the elephant are very large, which means that it hears properly to everything. Whether criticism (dushanam) or praise (bhushanam), it listens to both. 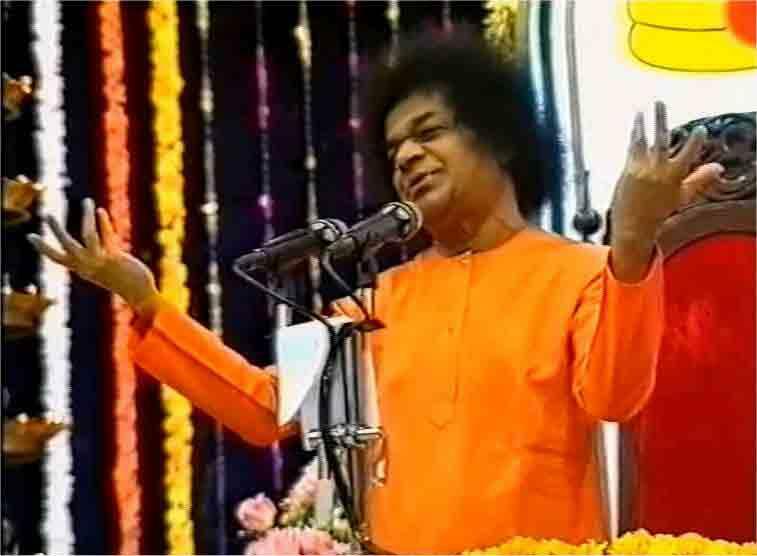 But what does it do with praise (bhushanam)? It nicely takes it inside. And what does it do with criticism (dushanam)? It hits it again and again (with its large ears) and throws it out. Thus it accepts good things into it and throws away bad things outside. This is the inner significance of the elephant head. Vighneshwara is created with the head of an elephant and the vehicle of a mouse to declare to the world the ideal and the truth that Divinity is not limited to the human form only. Divinity exists even in insects and in all beings. The elephant is supremely intelligent. It is full of loyalty. It will never forget its master, even if it loses its life. Without forgetting the master, so long as it is alive, with the principle of Divinity in it, it nurtures a sense of gratitude. The elephant stands for the quality of gratitude. Gratitude is a very sacred quality. Kshama (forbearance) is truth, kshama is dharma, kshama is vedam, kshama is non-violence, kshama is indeed everything. The elephant is the very embodiment of kshama (forbearance). The elephant would be ready to even give up its life, but it will never tolerate any pain to its master. The elephant shows the ideal path to humanity. In a forest that has no paths or roads, once an elephant walks through, a pathway is automatically created for the people. Therefore, in this forest of life, for the people who cannot see the pathway, the elephant (Ganesha) preaches and shows the path. The one donning the head with such intelligence is Vinaayaka. Therefore Vinaayaka means the one with intelligence, who shows the ideal path to mankind. 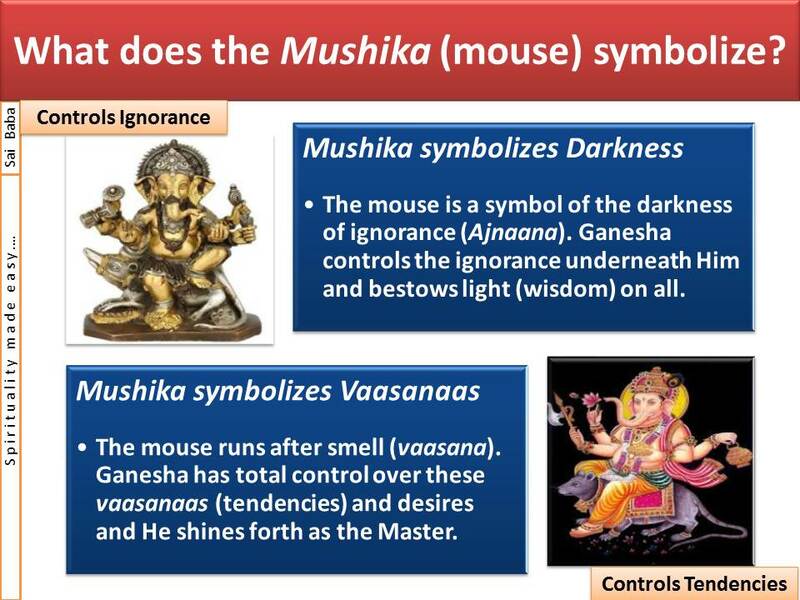 What is the inner significance of the Mushika (mouse) being the Vaahana (chariot) of Lord Ganesha? What is this elephant head and a mouse vehicle for Ganesha? The mouse is called a Mushika. The Mushika is a symbol for the night. Night stands for darkness. Therefore, the mouse symbolizes darkness (darkness of ignorance). 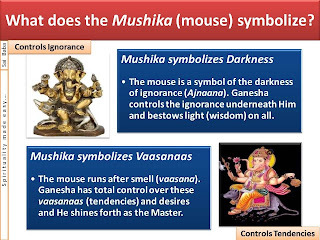 Since, Ganesha has trampled the darkness beneath Him (kept it under check), He is referred to as the one having a mouse as a vehicle. Vinaayaka is the master who dispels the darkness and bestows light on the world. Mushika is also a symbol of Vaasanaas (tendencies). The mouse keeps travelling to places based on vaasana (smell). Therefore, Vinaayaka is the one who has total control over desires, tendencies and ignorance. The mouse is the chariot of Vinaayaka. What is the meaning of a chariot? Chariot is the one which is below the rider. The one boarded on it is the master. Therefore, Vinaayaka is the master who has control over the tendencies, desires and ignorance. 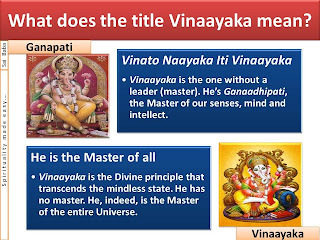 What is the meaning of the title Vinaayaka? He is also known as Vinaayaka. 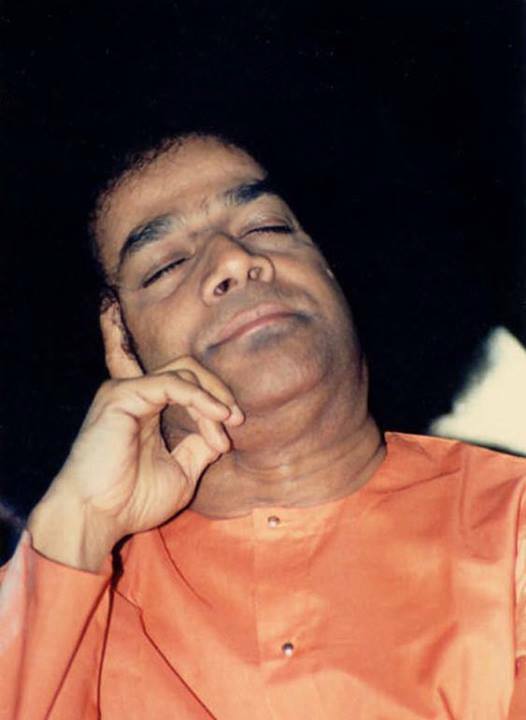 Vinato Naayaka Iti Vinaayaka – The one without any master (leader) is Vinaayaka. Vinaayaka has no leader. He is all independent (absolutely free). Everybody (in this world) has some leader (master), everybody has some authority above them, but Vinaayaka has no master. The one with the mind alone has a master. But, where is the (need for a) master for the one without a mind? Thus, Vinaayaka is the principle that transcends the state of amanaska (mindlessness). Without understanding this true principle of Vinaayaka, we merely regard Him as the physical and visible form having the trunk of an elephant, with four hands and with ears like fans. Vinaayaka is the master for the entire world, the universe, and all the beings. 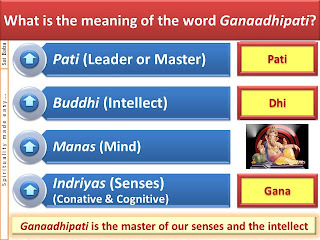 What is the meaning of the name Ganaadipati and Ganapati? Vedas describe Ganesha as Ganaadipa. Who are these Ganas? Are these angelic Ganas or demonic Ganas? They refer to the angelic Ganas. Where do these Ganas exist? Are they roaming around in the outer world or are they part of the inner world of the human body? Being the master of all the Ganas (angels), He is called Ganaadipa. Gana actually means the five senses. The principle of the five Karmendriyaas (instruments of action - conative) and the five Jnaanendriyaas (instruments of perception - cognitive) take the form of the Ganas. The master of all these ten senses is the mind. Mind being the master of the ten senses (Indriyas) is given the tile of Indra. Further, the Buddhi (intellect) is the master of the mind. 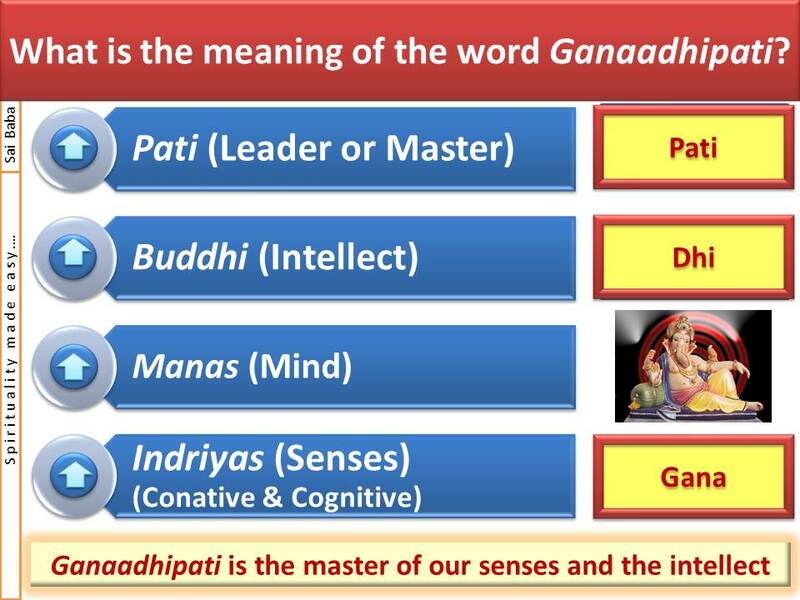 Therefore, Ganesha is called Gana (senses)-dhi (intellect)-pati (master). Next, what is the meaning of the word Ganapati? “Ga” means Buddhi (intellect). “Na” means Vijnaana (wisdom). As He is the master (Pati) of the intellect (Ga) and wisdom (Na), He is called Ganapati. Buddhi (intellect) is the master of the mind. Mind is the master of the senses. 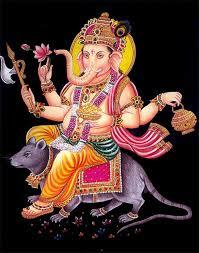 And as He is the head of all the Ganas (senses), He is called Ganapati. 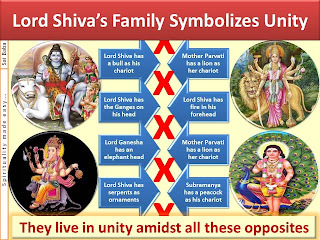 What is the message that the family of Lord Shiva conveys? 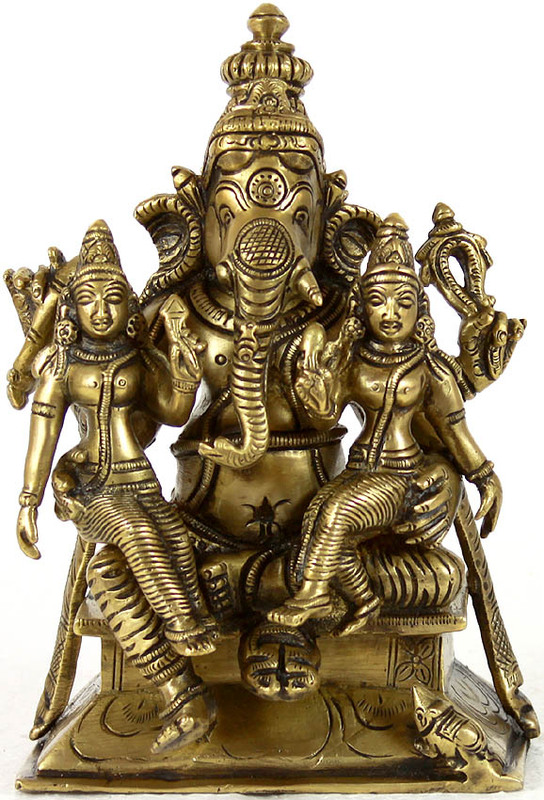 This is a family of four members: Iswara, Parvati, Vighneshwara and Subramanyam. They symbolize Paramatma (Divinity), Prakruti (Nature), Buddhi (Intellect) and Siddhi (Fulfillment) respectively. These four stay together in unity. If we enquire about this from a worldly point of view, the chariot of Iswara is the bull and the chariot of Pravati is the lion. The bull and the lion are great enemies. 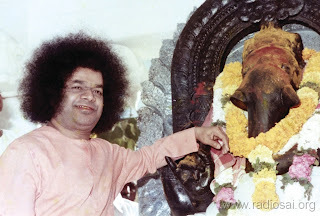 (Swami sings the Telugu song – Tandava Kelisalpene Parameswarudu Sri Sambasivudu…). 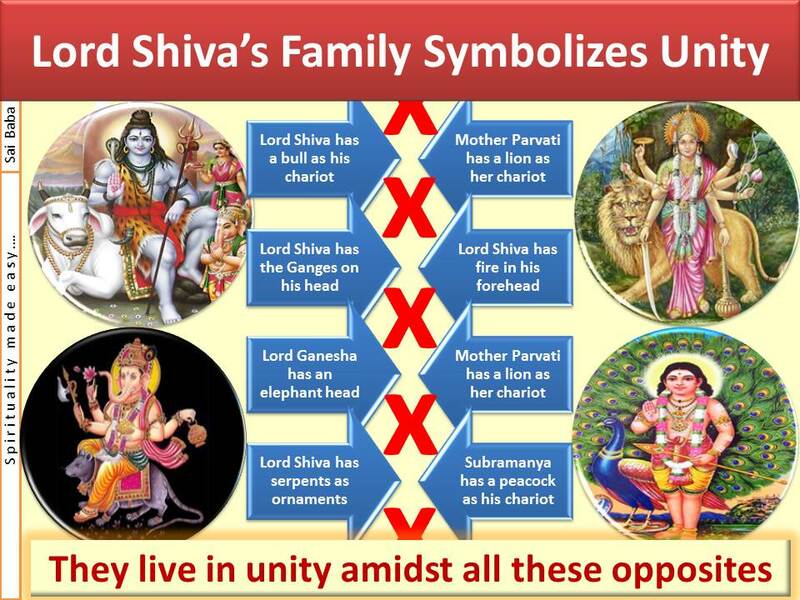 Lord Shiva has the Ganga on His head and fire (in the form of the third eye) in His face (forehead). Fire and water are opposites. However, they remain there without assuming or manifesting any opposition. Given all this, the family dances the Tandava dance. The Iswara principle brings about equality (unity) among all the opposites. The head of Vighneswara is an elephant’s head. His mother’s chariot is the lion. The elephant cannot survive if the lion appears even in its dream. Though being opposites, they live so intimately. The chariot of Subramanyam is a peacock. The ornaments of Iswara are serpents. These two are totally against each other. But all of them live together in unity. All this is a symbol to set an ideal to the world. Divinity thus demonstrates an ideal life to the entire world. Vighneswara has a serpent as a waist band. The chariot of Subramanyam is a peacock. Watching a peacock, the serpent just runs away. However such opposite or contradictory relationships experience unity in Iswara’s family. The family of Iswara demonstrates the symbol of unity to the world. 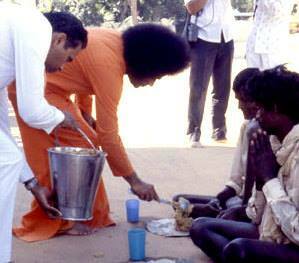 Why does Swami often address us as Bangaaroo (Gold)? I often call you as Bangaaroo, Bangaaroo (gold, gold). What do we mean by Bangaaroo (gold)? You are the one with Hiranyagarbha (golden womb – cosmic principle). Hiranyagarbhaaya Namah (obeisance to the Hiranyagarbha – cosmic principle). Your entire heart is full of the principle of Hiranya (gold). The gold may be converted into any ornament. If not an ornament, it can be at least kept as a coin. Therefore, the one that gets transformed into certain forms is gold, the one without any form is also gold. Thus, with a form you are gold and even in the formless state you are gold. Enquire a little into the nature of gold. (For example), if a customer takes a small amount of gold, he is asked to pay Rs.500. However, if some copper is mixed with the gold, the value comes down to Rs.300. Further, if some brass is mixed into it, the price further comes down to Rs.200. What is the reason for the price to come down? Mixing (adulteration) is the cause for the price to come down. Why should you mix this copper and brass with pure gold? Because of mixing with these, the value of gold goes down. (Similarly) when we are born, we are pure and highly valuable. However, as we grow, the copper of desires get mixed into us. The brass of ego also gets mixed into us. Consequently, our value goes down. What is the reason for our value to go down? The reason is the mixing of valueless materials with that which has high value. Therefore, we should not allow cheap materials (desires and ego) to get into us. 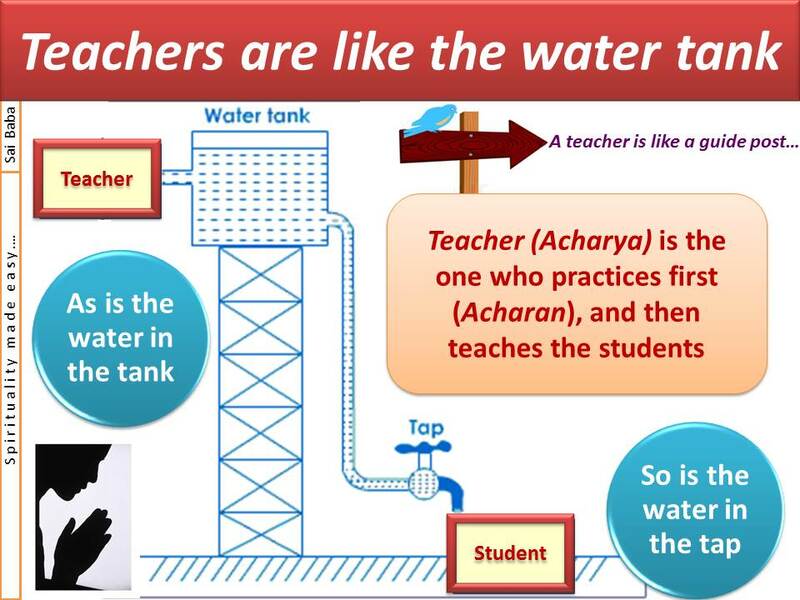 Who is a true teacher (Acharya)? The teacher is an Acharya. What is the meaning of an Acharya? Acharya is not merely a teacher. Acharya is the one who practices and then teaches. 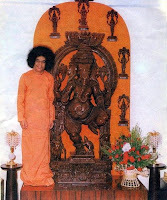 Therefore, the name Acharya is given because the teacher is supposed to practice and then teach. First follow and then teach the children. Children may have some bad habits. The teachers must first of all control these bad habits themselves and then train the children accordingly. If the teacher himself sits in the college and keeps smoking, the children too would come smoking to the school, the next day. The teacher may shout at the student, “Aye, why are you smoking?” The student would reply, “Sir, you too are smoking”. What reply can the teacher give to this question? No reply. He can only apply, but no reply. Therefore, if you want to teach the student, then you must not practice this bad habit in front of the student. If you practice any bad thing, the students too will start following you. Whatever you think is good and you want to teach to the students, you must practice first. Do good and teach good. This is the correct way of teaching and the right characteristic of education. With this, the goodness in the students will manifest itself. Such a student will come to the teacher and will confess on his own, “Sir, I have committed so many mistakes unknowingly. I have done this, I have done that….” Saying so, from that day onwards the student will turn into a good person. I know this very well as I punish the student in many ways. I shout at them, I advise them, I love them, I give them everything; but at times, I am very stern. 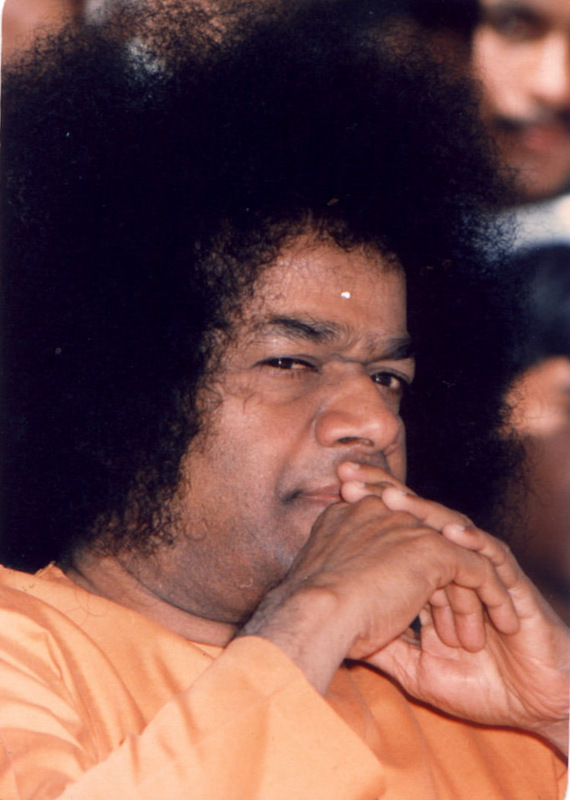 At such times, the children come on their own to Me and say, “Swami, I have committed a mistake. Please forgive me. I have not been able to follow what You have said. Now I am able to recognize the truth in what You said. 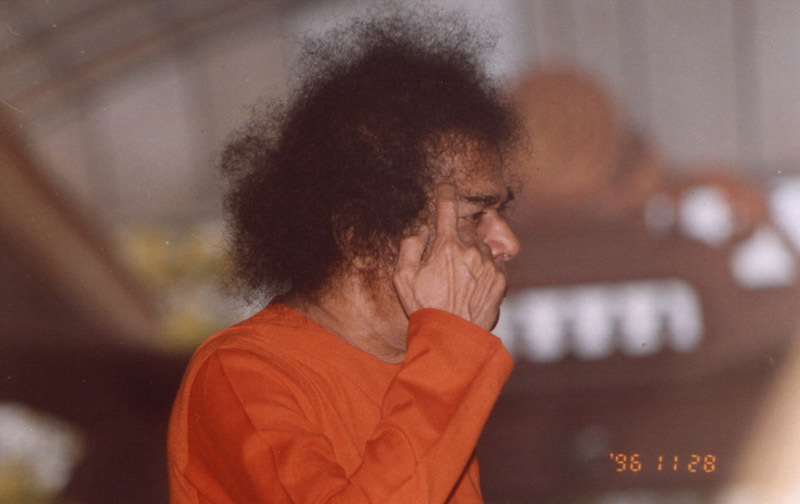 Henceforth, I will not commit such mistakes.” Swami melts at this and responds, “Son, be good hereafter. Ensure that you do not change again. Whatever I do is for your own good.” Teachers also should teach their students like this. What is the real purpose of human birth? Serve the world. We are born in this world for undertaking service and not for wielding authority. What is this authority? We are born mainly to serve others. 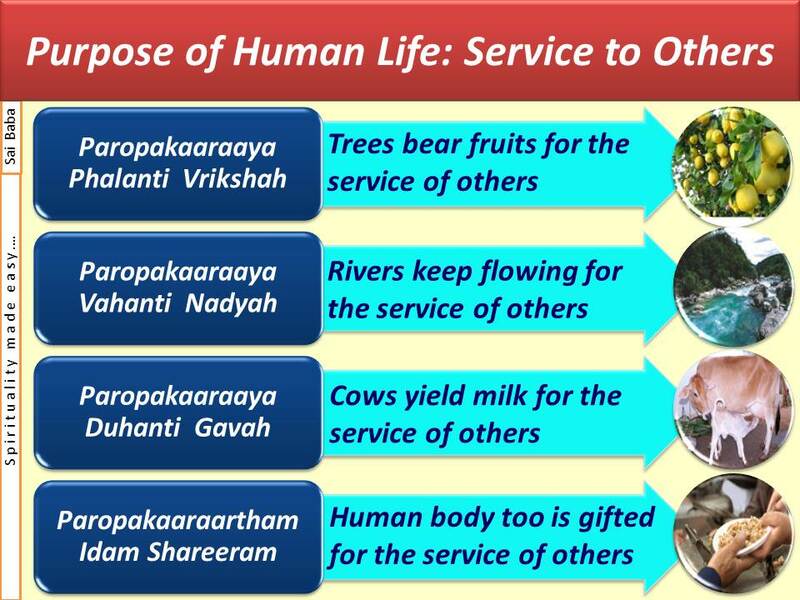 God made us take birth (in this world) only for the purpose of service. Therefore, understand the truth that we are born for service. Service does mean government service or this or that service (i.e. your jobs). You can do your respective services (jobs). But the real service is service to humanity, service to the world. Help the poor. Serve the sick people. Give strength and empower the weak people. Life is not meant for earning money to fill our stomachs alone. Recognize the truth that there are crores of people out there who also have a stomach that needs to be filled. They go through so many difficulties. We must take the initiative to help and serve such people. Then alone will our lives be truly fulfilled. What is the significance of the Gopikas churning the curd to get butter? Krishna replied, “Mother, I am not taking the butter. I am taking away their hearts. The heart is pure. Mother, do you know how their hearts are? Nirgunam (attributeless), Niranjanam (blemishless), Sanaatanam (eternal), Niketanam (ever immersed in oneself), Nitya (permanent), Shuddha (ever pure), Buddha (ever illumined), Mukta (totally free), Niramala (immaculate) Swaroopinam (embodying all these). Such butter (heart) is not available in our home. You ask me as to why I find the butter of their houses so tasty. In the early hours of the morning, the Gopikas insert the churning rod into the curd inside the pot. 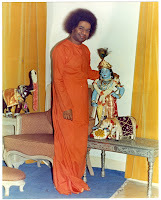 They wind the rope around the rod, and as they churn the curd taking the name of Krishna, their bangles (hit against each other and) give the right taalam (music beat) to the chanting of the name of Krishna. The swirling of the rope around the churning rod is like the shruthi (musical note). With this shruthi (musical note) and taala (beat), they churn the curd. After the churning, the one which floats on the top is the butter. 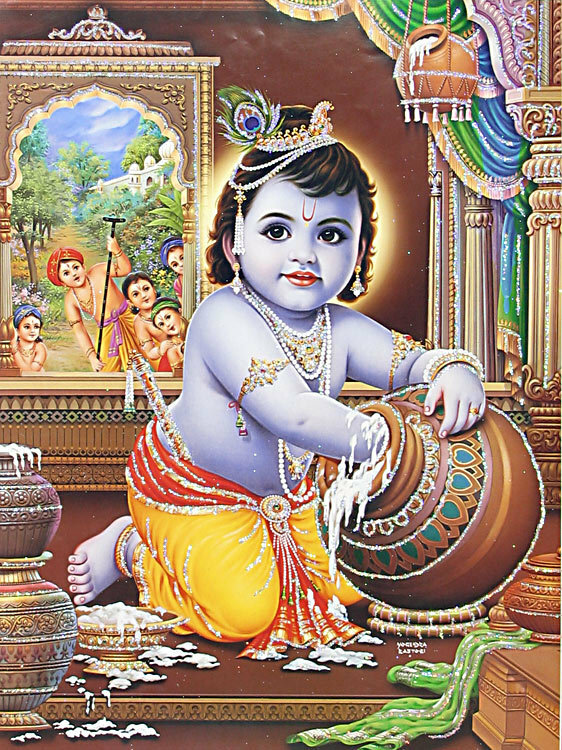 What is the inner significance of Krishna stealing the Butter? Krishna is the stealer of hearts!! Not all can recognize the reality of Krishna. We think, “Oh! 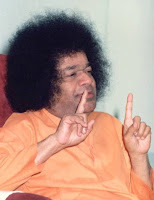 He is the son of Yashoda, who indulges in silly acts like taking butter from one house and dropping it in another’s house.” Why should Krishna indulge in this type of “cheating”? We consider this as “cheating”. No, it is not cheating at all. There is a lot of significance in this. What exactly is butter? When milk (after curdling and transformed into curd) is churned and the essence is extracted from it, it assumes the form of butter. Similarly, to bring forth or manifest God (as unity), who resides in all forms of life (as diversity), such churning has to be carried out. There is Divinity in such unity. That is why devotees sing “Bada Chitta Chora, Brindaavana Sanchaara”. 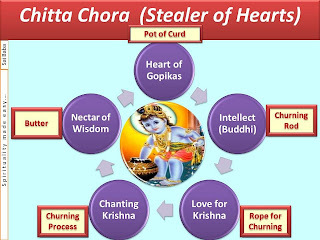 They call Krishna as Chitta Chora (the thief of hearts). When called so, Krishna used to feel very happy. Actually if you call someone a thief he would get into a fight with you and question you, “What, am I a thief?” But with Krishna it is not like that. He has to be called out loudly, full throated - Bada Chitta Chora, Brindaavana Sanchaara. You are a thief. People sing like this with appropriate beat and feel so happy. 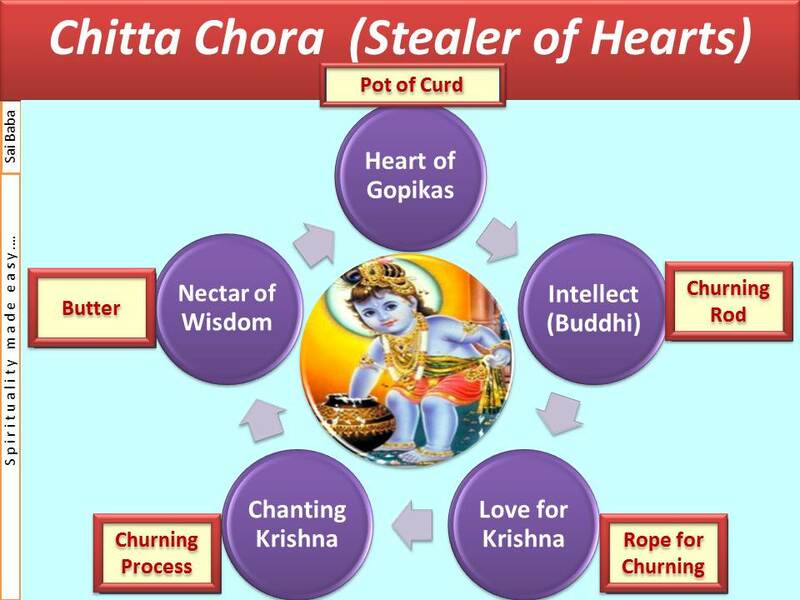 When we refer to God as thief, it means He is Chitta Chora (stealer of hearts). He shines forth in the hearts of all. The Chitta or awareness within the heart is symbolic of the butter. Krishna is the one who steals such hearts. What is the meaning of the word Krishna? We must understand properly the meaning of the term Krishna. The word has three meanings. One is “Krishyathi Iti Krishnah” (The one who cultivates is Krishna). Krishi means cultivation. What is it that has to be cultivated? Krishna cultivates the Hridayakshetra (field of the heart). 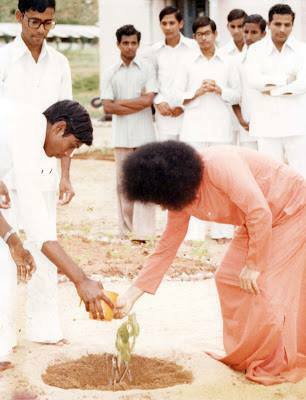 He removes the unwanted weeds of bad qualities, waters it with the water of love and softens it, ploughs it with the use of sadhana and sows the seeds of devotion to God. This is how Krishna cultivates the field of our hearts. This is “Krishyathi Iti Krishnah”. 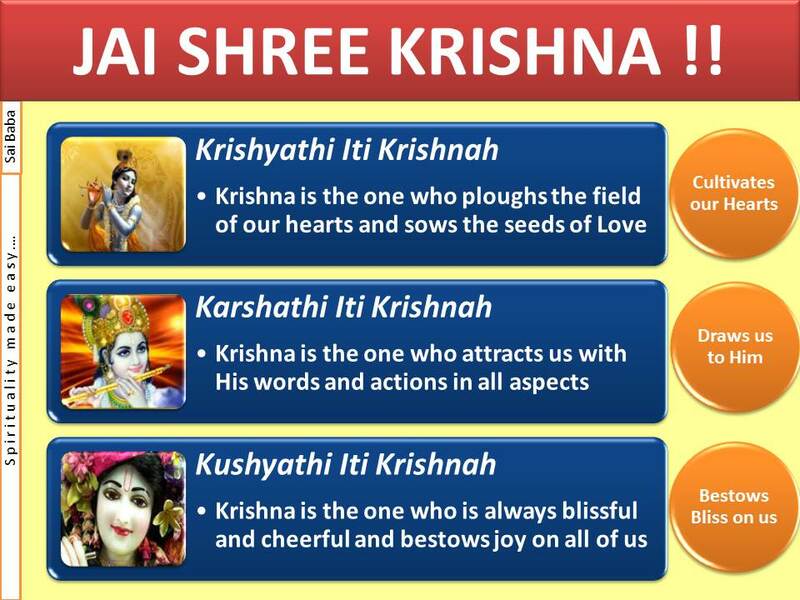 The second meaning of the word is “Karshathi Iti Krishnah” (The one who attracts is Krishna). Karsha means the one who attracts. Krishna attracts you with His eyes, His speech, His actions and His flute. He attracts you with every aspect of His. By His (soothing) words, He cools down the hearts filled with anger and makes them cheerful. 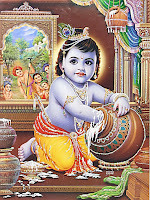 Once when Krishna was a small child, He went to the house of a Gopika, climbed up a pillar and took the curd that was kept in a pot suspended from the ceiling. The Gopika approached him with all anger. She caught hold of the pillar and said, “Let me see how you will get down now. I will take you to your mother Yashoda right now. She always claims that her son never commits any mistakes. Now I will expose you to her red handed”. Looking at the Gopika coming with all anger, mother Yashoda (went with her and) questioned Krishna, “Krishna, what are you doing?” Krishna replied (most innocently), “The calf in our house is missing. I was seeing whether it has come here by any chance. The Gopika could not contain her laughter at this answer. Can a calf ever be found in a pot tied within a basket? Thinking so, she laughed loudly and covered her face with her hands. The moment she let go, Krishna jumped down and ran away. Thus in every act of His, there is attraction - “Karshathi Iti Krishnah”. 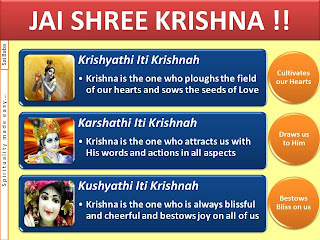 A third meaning of the word Krishna is “Kushyathi Iti Krishnah” (one who is always blissful). Kush means happiness, the one who is always blissful and joyful. Krishna is always in a state of overwhelming bliss. It was because He embodied the principle with these sacred qualities, that sage Garga named Him Krishna. The ordinary meaning of the word Krishna is “one who is dark”. We generally think only of this meaning and forget the deeper and inner meanings of the Lord's name. The funny part was that He preached the Truth to the world, manifested and declared the eternal reality, but yet with humour in life; He gave joy to the people all around. 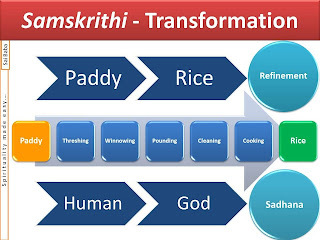 Samskrithi means the one that is refined or transformed. The word samskrithi, originates from the root samskritham. It refers to the process of refinement of every object that is in its natural form, before it is made fit for human use. A small example; we eat rice every day. But consider how many transformations are undergone by paddy before it reaches this state and becomes fit for consumption. Threshing the paddy grains from the sheaves, winnowing and separating grains from chaff, pounding or milling to remove the husk from the grain, cleaning the rice by removing extraneous matter like small stones and weed seeds, etc., soaking the raw rice in water, and finally cooking over fire to get cooked rice that we can eat. Such samskrithi (refinement) makes it possible for us to consume the rice. 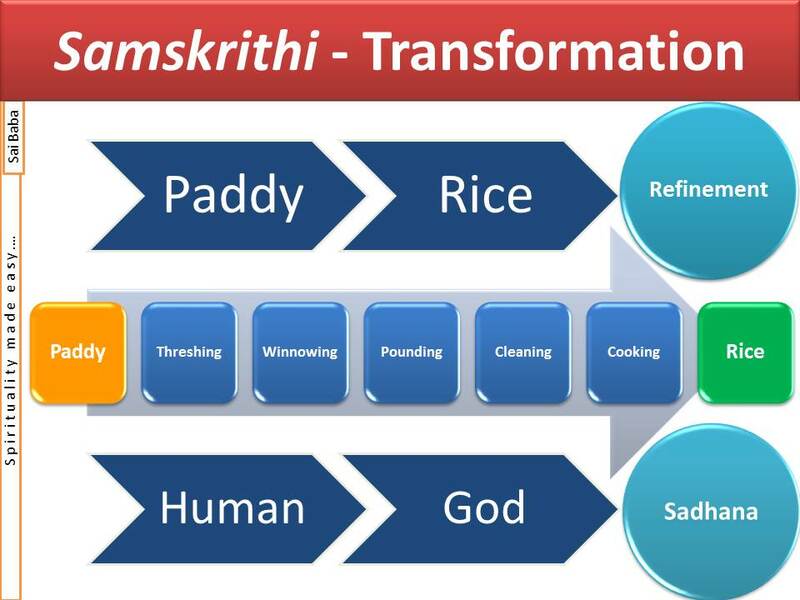 Samskaaram (transformation) also enhances the value of things. For instance, the value of paddy is, say, one hundred rupees per bag. But, when it is dehusked and cleaned in the milling process and made fir for consumption, the value of one bag of rice becomes six hundred rupees. What is the reason for one sack of paddy costing a mere Rs.100, to assume the value of Rs.600 when it is converted into a sack of rice? The value comes from the process of transformation. We wear a watch on our wrist. If a wrist watch made of stainless steel is crushed and thrown into fire, the resulting mass of stainless steel will not be worth even a quarter of a rupee (2 annas). But what is the reason for you to pay Rs.1000 and buy the watch? It is the process of refinement. It has been made into a form that we can experience meaningfully. Bolts, nuts, screws, pins, alarms, all have been assembled in the right way in the course of the transformation process. This is what causes the value to rise. Since ancient times, Bharatiyas subjected all objects to the process of transformation and enjoyed them. Here is a cloth. But what all processes of transformation it has to undergo to become a cloth. Cotton harvested from the cotton plant has to be dried, the unwanted calyx removed, and then put in a ginning machine to separate the seeds from the lint; the lint has to be spun into yarn in a spinning machine, and the yarn has to be woven into cloth in a weaving mill. We are not enjoying cotton as cotton itself. We subject it to a number of refinement processes and then don the same as cloth. Likewise, it is futile for man to remain in the same state in which he was born. He should manifest his inherent divinity that is beyond humanity. We must make an attempt to undergo such individual transformation. First of all, you must develop purity. When purity develops in you, unity will come to you naturally. When there is unity, Divinity will manifest itself. So long as there is no purity, we will never get unity. Unity with whom? Is mixing with and connecting to our friends, unity? No. no. Primarily, unity must be with God. Once you achieve this (Divine) unity, you will, in a very natural way, get worldly unity. Worldly unity is only about “Hello, hello, hello, hello”. Is this unity? When there is money in the pocket, when your father’s position is very good, when everything is fine, all will come to you saying “hello, hello”. When the money is gone and the position is gone, there will not be anyone in the world to even say goodbye to you. So long as there is water in the tank, there will be thousands of frogs over there. Once the water dries up, there will not even be one frog over there. Therefore, unity related to the world is all based on money, money and money. Money makes many things, money makes many wrongs. With respect to God, it is “Mann” (mind) and with respect to the world it is money. We must seek unity through the mind. Mind to mind, heart to heart, love to love; not body to body. If we truly wish to achieve unity, we cannot do so by any path other than the Divine path. All things (in this world) undergo change but Divinity never changes. Only when we follow the Atma that never changes, the world can be safe and secure. 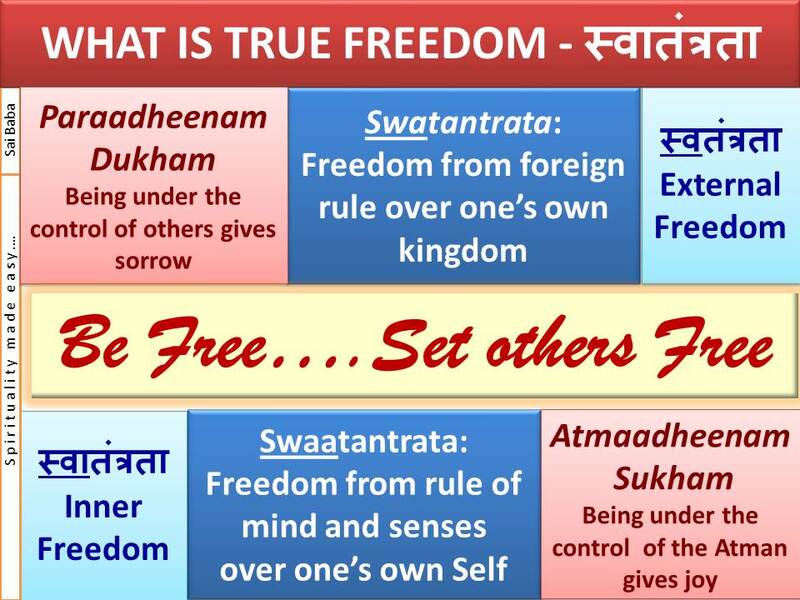 What is the meaning of Swatantram (freedom)? Tantram means Atma (Self). Swaa-Tantram means following the Atman, coming under the control of the Atman (Self). 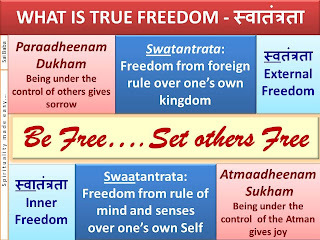 Paraadheenam Dukham Atmaadheenam Sukham – One who is under the control of others will be full of sorrow, while one who is under the control of the Atman will be full of happiness. Therefore, it is called Swaatantram, i.e. follow your heart (not physical heart but spiritual heart symbolic of one’s inner/higher Self). Your heart is your Guru; your heart is your God; your heart is your Master. Therefore, it is said - Follow the Master, Finish the Devil, Fight to the End, Finish the Game. Those who follow their heart will gain victory. Thus, follow God. Why do we face difficulties in life, though we think of God? What must be the two banks for the river of human life? The Bhagavad Gita has laid down two banks to channelize the flow of its message. In the absence of these banks, the river of life will be subject to many problems, difficulties, and hazards. On one side is an eight lettered mantra and on the other side too there is an eight lettered mantra. 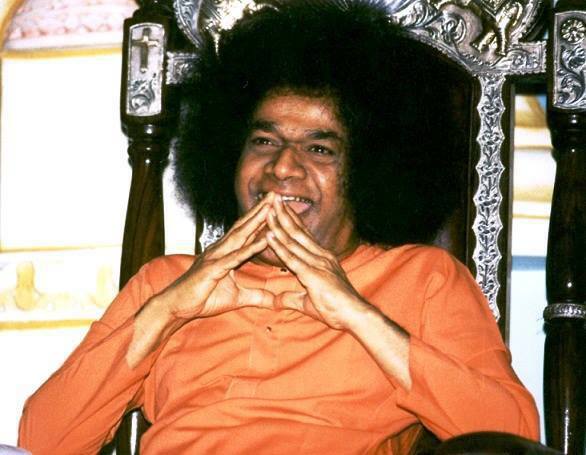 The inner meaning is that when the river of life flows in between these two banks of mantras, it will be blessed with peace and happiness and will ultimately reach the sea of Divine Grace. On one side is the eight lettered mantra – Shra-ddha-vaan-La-bha-the-Jnaa-nam (Shraddhavaan Labhathe Jnaanam: the man of faith acquires supreme wisdom). On the other side is the eight lettered mantra – Sam-shay-Aat-ma-Vi-nash-ya-te (Samshayaatma Vinashyathi: the one filled with doubts will perish). Human life can reach its goal only when there is Shraddha (faith) on one side and Nisamshayam (doubtlessness) on the other side. Thus, the Gita declares that faith and freedom from doubts are very essential for human beings. What is the role of Buddhi (Intellect) in human life? Dear students, according to the declaration of the Upanishads, we have recognized that the human body is like a chariot, the sense organs are like the horses, and the mind is like the rein. The principle of the body, mind and senses, by themselves, are useless. However beautiful the chariot may be, however dependable the horses, and however firm and secure the reins, all of these are of no use if there is no charioteer. (Similarly, however efficient the body, the senses and the mind may be, they serve no purpose in the absence of the charioteer, namely, buddhi-intellect). Therefore, in the journey of life, the intellect is of prime importance. It is called Nischayatmika Buddhi, which means that the intellect has the decision-making capacity. In daily life, many difficulties, problems and disturbances arise from time to time. It is the prime duty of man to overcome these obstacles. But then, what is the key to the solution for these problems? It is the Buddhi (intellect). Without the intervention of the intellect, none of our problems and difficulties can be solved. “Samshayaatma Vinasyathi”, (meaning that a man filled with doubts will perish – Bhagavad Gita). Because the Buddhi destroys doubts, it is said (in the Gita) “Buddhi Graahayam Athindriyam”. As the intellect transcends the senses, it takes the form of the one that dispels doubts. Who is a (true) Guru? Not the Gurus of today! Whispering a Mantra into the ear and stretching one’s hand for money – is this the Guru principle? This is not the Guru principle. Gu-Ru - Gukaro Gunateethaha Rukaro Rupavarjithaha. We must consider the principle that is beyond attributes (attributeless) and that transcends the form (formless) as the Guru. Therefore the Guru is very essential for us to understand this principle, which is beyond attributes. Since it is difficult to get such Gurus, consider God as your Guru. My salutations to such a Guru. Guru is everything for me. He is Vishnu, He is Shiva, He is Brahma, He is everything. Therefore, in this world, everything is a manifestation of Divinity. Sarvam Khalvidam Brahma (verily all this is Brahman). Whomsoever we see, they are embodiments of Divinity. Whomsoever we see, they are verily the form of Vishnu. We are witnessing the Vishwa Viraata Swaroopa (Cosmic form of the Lord). The Vedas have said, Sahasra Seersha Purushaha Sahasraaksha Sahasra Padh (With thousands of heads, thousands of feet and thousands of eyes, Divinity pervades everything). Whomsoever we offer our salutations, Easwara Sarva Bhutaanaam – it amounts to saluting God Himself; this was their practice. Sarva Bhuta Namaskaaram Kesavam Pratigachchati, Salutations to all beings reach Keshava and Iswara (God). Why? Because, Eswara Sarva Bhotaanaam (God is the indweller of all beings); Isaavaasyam Idam Jagath (the entire universe is permeated by the principle of God). Therefore, one cannot restrict Divinity to a particular place. Here, there and everywhere, there is only one Atman (God) present everywhere. There is only one who resides in the heart. The same Iswaratva (Divine Iswara principle) exists in all. The Vishnutwa (Divine Vishnu principle) in all is the same. We are developing differences only out of our delusion, but there are no differences in Divinity. Sarvam Khalvidam (everything is Divine). Gurus in those days were created to propagate such principle of oneness. Today there are many good disciples, but it is very difficult to find a true and noble Guru. What is the true meaning of surrendering to God? Do your best and leave the rest to Him! Just because you surrender to God, does it mean God will take care of everything? The duty that you need to perform has to be carried out. Kartavyam Yoga Muchyate - You must discharge your duty properly. It is sheer laziness to give up your duty and consider that God will take care of everything. To ensure that the food in the plate reaches your stomach, is it not necessary to make use of your hands and mouth? Just looking at the food in the plate if you keep repeating “potato chapatti” any number of times, will it ever fill your stomach? You do have the strength. In case you do not have the strength, then at least it may be fine to just leave everything to God. Whether you have the strength or not, perform all your activities as an offering to God. This is an excellent work. I congratulation you for starting and maintaining this.